Visions of Jesus Christ.com - Virgin Mary sheds tears of blood Hryniewicze, Poland. June 10, 2012 Reported [here] and cell phone video [here]. Hryniewicze: Miracle. Our Lady cries tears of blood. I came and suddenly I see: Our Lady cries. Tears of blood. I fell on my knees. It's a miracle says the takeover of Jadwiga Hryniewicz near Bialystok. The news spread through the neighborhood. People come to see the statue. People come to Hryniewicz daily. They pray, take pictures. In Hryniewiczach near the bus stop is a small, wooden-covered hut the logs. This village and club. The inside is modest. In the corner with football table, and next to the wall there is a makeshift altar decorated with flowers. On the table is standing a statue of the Virgin Mary. Right next to pictures of John Paul II, the Lord Jesus. On the walls hang paintings of saints and rosary. In the village there is no church, so here the faithful come to pray. And here, contrary to the residents of the village, there was an unusual event. 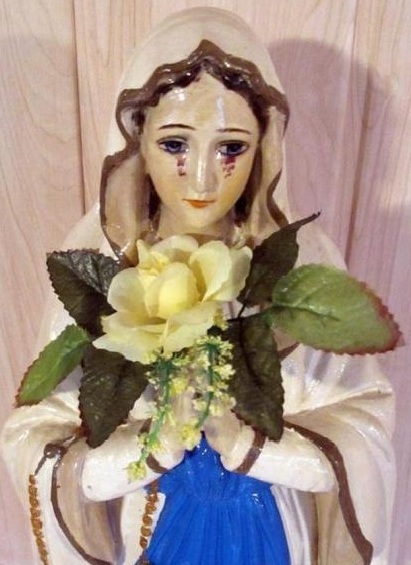 The Virgin Mary statue tears of blood flowed. The world wonders occurred after a small, poor villages, and modest conditions - says Jadwiga. I do not want to give your name to - he says - not to create unnecessary sensationalism. Modest, older woman, in Hryniewiczach lived for 46 years. She is a widow and grandmother of three granddaughters. That she first saw this extraordinary event. This is definitely a sign - says Ms Jadwiga. She saw a weeping Virgin Mary. May 24th, as always after 18 came to the commons for the May devotion. But not at once drew attention to the statue of the Virgin Mary. She began to bustle before the coming of other residents. She opened the shutters, if you do not have checked the water the flowers, and even napkins are. I suddenly glanced at the statue. She saw that Our Lady has something red under the eyes. In surprise until she took off her glasses, looked at this phenomenon closely. - With painted eyes like bloody tears - says the acquisition of a woman. I was shocked. I did not know what to do. Annoyed circled room. I fell on my knees. I began to pray earnestly. I knew I saw something unusual, extraordinary. Soon came the other faithful. They noticed the same thing, although you Hedwig them said nothing about it. Since the remarkable events in Hryniewiczach lounge attracts crowds of worshipers. They come from every area, from . Many of curiosity, take pictures, watch a figure with a magnifier. People think that's a bad sign. It can again be converted Firmly believes in the miracle of Anna Gołębiewska from Bialystok. On Tuesday, the first time, shedding tears of blood saw the Blessed Mother. I brought flowers for Matuchny to comfort her. I think she is crying for their children. Regrets over our lives, weak faith - says Anna. Very few people from our village came to the prayers of May, just a few Jadwiga nods. He adds that the day before, May 23, knelt before the statue, and the prayers talked with the Virgin Mary. Trinity only knows why. Maybe it's a miracle happened and the next day came the tears. Perhaps in such a way that Madonna wants to convert people to make again started to believe - explains Ms Jadwiga. But not everyone is convinced that Hryniewiczach miracle happened. Specific approach to this particular young. They smile in disbelief. Shrug. On this subject does not want to speak to Elizabeth Stankiewicz, mayor of the village. - Do not know if it's a miracle. Yes, it got loud about it, but it is not necessary. Someone unnecessarily gossiped about before anything is confirmed. Also, clerics speak very cautiously on the alleged miracle in Hryniewiczach. The pastor of the parish church. St. Stanislaus in Bialystok, which includes the village, he saw the statue of the Virgin Mary, but does not want anything to comment. Whether there was a revelation, confirmed research - is responsible. Older people, however, its Hryniewicz know. Certainly in their village happened to something special. They believe in it deeply. - We can rise to the shrine in the future - hopes Fiedorczyk Janina.